The Fourth of July is right around the corner. On Independence Day, people across the country will be firing up their grills and lining up their hamburgers and hot dogs. After these fun-filled barbecues, families, neighbors and towns will wait for evening to fall so that they can head for the nearest fireworks display. The magic in these time-honored and treasured traditions bring families and communities together, and they create memories that will last a lifetime. While fireworks and barbecues are what make July 4th special for a lot of people, there is always room for improvement. If you’re interested in putting a new spin on these old favorites, try Fireworks Bingo to add a little something different to the tried-and-true repertoire. Playing Bingo can be lots of fun for both children and adults. And, of course, if you have some hard-to-please teens, this is also a great way to engage those who might be outgrowing the desire for family togetherness. 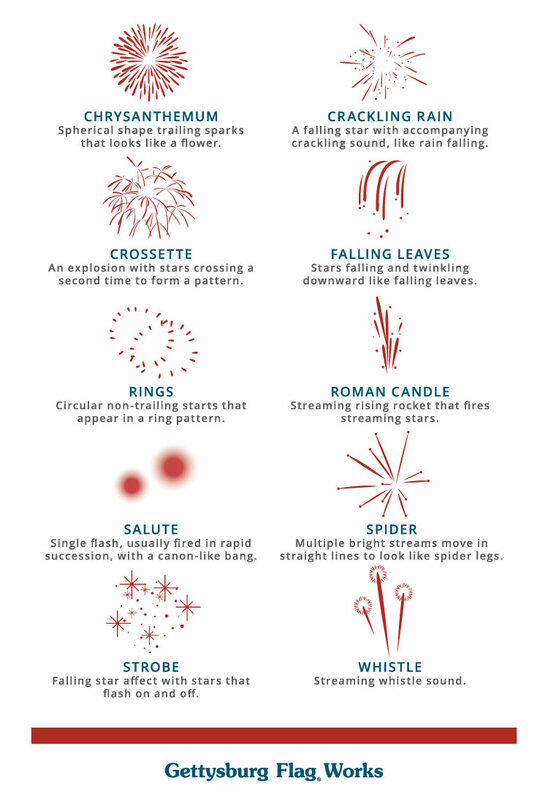 There are several categories of fireworks, and there are variations in shape, sound and behavior even within those categories. Spherical fireworks are some of the most popular and widely used types of fireworks. The large flower-like blooms fill the sky with color and make a great impact either as a singular image, or in small groups. Other flower-themed fireworks are favorites, too, like Chrysanthemum, Dahlia, Diadem, Peony, and Pistil. Like the Chrysanthemum, a Brocade has trailing stars or sparks that float down following the initial burst. Others, like the Dahlia or Peony, do not have trailing sparks, but they display a large burst before burning out. For a distinctive fireworks display, lots of people love streaming fireworks. The hallmark of a streaming firework is delayed movement of sparks or stars from the initial explosion. Streaming fireworks can have the appearance of lots of things, from Fish, which has stars that swim away like a swimming fish; to Go Getter, which thrills with random, unguided sparks; to the iconic Roman Candles, which features a rising rocket that fires streaming shooting stars. A falling star firework is exactly what it sounds like – a fireworks display that appears to be a falling star. Falling Leaves and Crackling Rain are two popular versions. They both feature stars that are falling or fluttering through the sky. The sound that accompanies them is a crackling noise that sounds like a rainstorm, which makes the Crackling Rain firework distinctive. For some people, the best part of a fireworks display is the sound – the “boom” in the pit of your belly can be just as exciting as a beautiful show in the sky. The Salute and the Whistle are known for being the hearty sound behind a fireworks display. Circular fireworks are defined by their unique ring or circle patterns. Unlike spherical fireworks, they have no distinct center. The Palm Tree firework’s trailing rocket and spherical trailing shell give it a tropical look. The Horsetail fireworks have similar properties to the Falling Star fireworks, but with a distinctive clustering effect that leads to an appearance that likens a horse’s tail. The Bowtie fireworks explode into a ring, similar to the circular fireworks, but in a crossed fashion that creates a bow-tie shape. 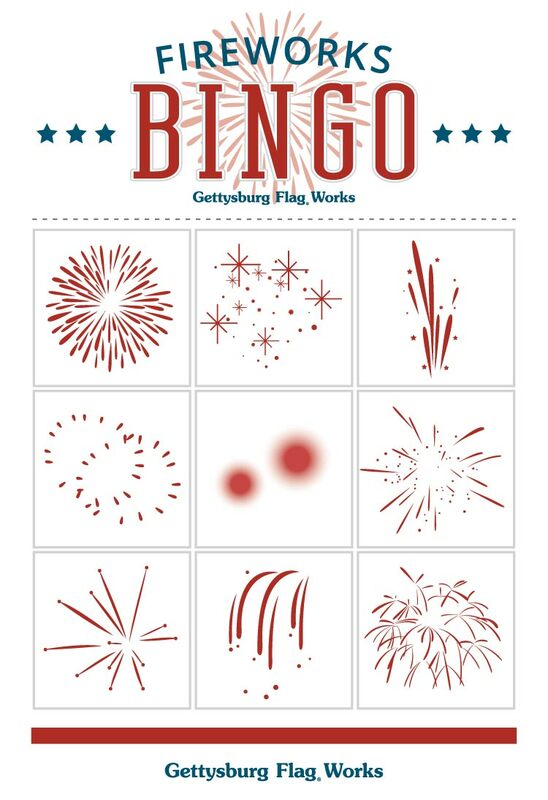 Now that you know about lots of distinct types of fireworks, you can play along with this set of Fireworks Bingo cards. Take the cards along when you and your family or friends head out for your local fireworks display, and see who can spot the favorites and get to “Bingo” first. Print the cards on a heavy card stock and remember to bring markers or stickers for each player. While you’re watching the fireworks show, cross off the fireworks on your Bingo card as they explode in the sky. The first player to fill a vertical row is the winner. Does your community or vacation spot have fireworks all summer long? Make Bingo a tournament! You can laminate the cards and mark the spots with dry-erase markers – that way they become a reusable part of family fun! We’d love to hear about your favorite kind of fireworks in the comments below!